so difficult for a dentist? Molar root canal treatment is much more complicated than root canal treatment in other teeth. In fact, molar root canal is one of the most difficult of all procedures for a dentist! This might seem a strange thing to say. 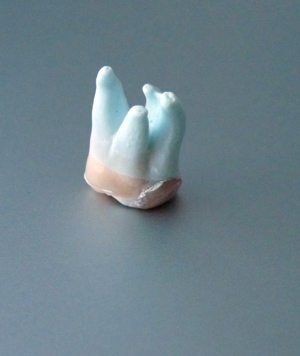 After all, what about extracting a wisdom tooth, or making a cap or crown? These are all difficult and challenging procedures for a dentist, but I believe that most dentists will agree, doing molar root canal correctly is one of the hardest procedures to get right. Molar teeth have more roots than other teeth, and therefore more root canals. The usual minimum is 3, but they frequently have 4, and some can have 5 or 6 ! As well as having more root canals, the canals are also smaller and more difficult to find than in other teeth nearer the front of the mouth. 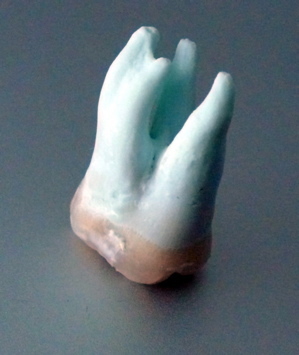 The roots of molar teeth are frequently curved or bent. Molars are at the back of your mouth, so they are more awkward to reach, and also there is less space for the dentist's fingers. Add these factors together, and the degree of difficulty is not just double that of a front tooth, it's 4x or 6x as difficult to carry out a good treatment! Here are three pictures of the same molar tooth, from different angles. 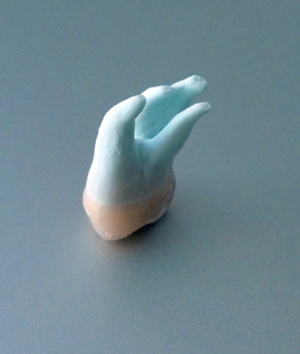 It is an upper molar tooth. Each picture is rotated a quarter turn clockwise from the one before. You can see the curved roots. Also that 2 of the 4 roots are joined or fused. This tooth has at least 4 root canals inside it, maybe more! So, how good does the root canal treatment have to be for a successful result? And how long should it last? Are there any other issues? To answer these questions, I'll have to give you a short intensive course on root canal treatment! Let's start at the beginning. What is the point of a root canal treatment? The whole point is to treat the tooth so that bacteria cannot breed inside it and cause an infection in the bone around the root. BUT NOT EVERY TOOTH needs a root canal treatment - of course! A tooth only needs treatment if the tooth nerve has become inflamed and is causing severe toothache, or else the tooth nerve has actually died and caused an infection on the root. When either of these problems crops up, we have to decide whether to simply extract the tooth, or try to save it with root canal treatment. You can find out all about how to make this decision at Alternatives to Root Canal. SO, you have made the decision to try to save the tooth. Now the dentist has to start his molar root canal procedure. What he is trying to do is get rid of the cause of your pain, and treat the tooth so that it doesn't get infected again. The only way to do this is to clean out the root canals inside the tooth, disinfect them, and then seal up all the little spaces inside the tooth where the nerve used to be. ALL the spaces. If any spaces (root canals) are not disinfected and sealed up, bacteria will be able to breed. Here are 2 photos of molar root canal treatment that I performed a while ago to save a molar tooth. The first photo shows the molar with a big filling in it. The nerve in the tooth was starting to die, and causing a lot of toothache. The second photo shows the final result, after about 3 hours of treatment, with the root fillings extending all the way to the tips of the roots, ensuring that there is no space for bacteria to breed. What things can go wrong with molar root canal? The most common reason for problems is the dentist not finding all the spaces inside the tooth - not finding all the root canals. Remember, some of the root canals can be the size of a human hair. Not easy to find! In fact, it's very hard. If a root canal is missed, it will remain untreated, with the dead and rotting nerve tissue inside it. It will be a hiding place for bacteria, which will result in the tooth becoming infected later on. Because molar teeth have MORE root canals, AND they are smaller and finer, it can be easy to miss one. The next most common reason for problems is not disinfecting the canals completely. There are many types of bacteria that can infect a tooth, and we need to kill them ALL with disinfecting liquids. The usual disinfecting agents are sodium hypochlorite (dilute bleach) and chlorhexidine gluconate. Both solutions should be used when cleaning the root canals inside a tooth, to make certain that all the different bacteria inside the root canals have been killed. But it is important to rinse out the hypochlorite with sterile water before using the chlorhexidine, as they react with each other if they come into contact! The use of a "chelating" agent such as EDTA or citric acid also helps to clean out the canals. These "chelating agents" dissolve the microscopic dentine particles that are being rubbed off the root canal walls during the procedure. This makes it easier to flush all the debris out of the canals. Because molar teeth have narrower root canals, it is more difficult to be sure that the disinfectants have reached all parts of each canal. EDTA or citric acid helps to open up the root canals, so that the disinfecting solutions can reach all parts of the root canal system. The final problems come with trying to seal the spaces that have been found and cleaned. 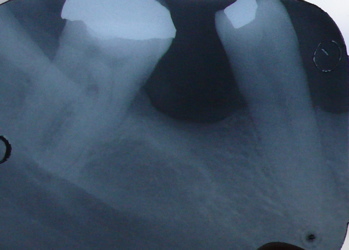 If we don't seal the root canals, bacteria can get back in and set up infection. Each root canal must be sealed for its whole length, all the way to the tip of the root. If any tiny spaces are left unsealed, it may be possible for bacteria to get in. In molar teeth, we are again faced with multiple root canals that are smaller and frequently curved. 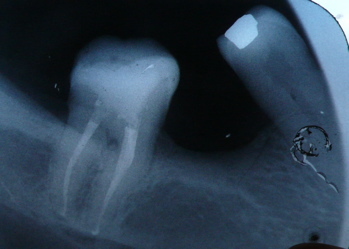 And then we also have to seal the biting surface of the tooth with a perfect filling or crown (cap). As you can see, molar root canal is more complicated for several reasons. Basically, the canals are smaller and harder to find, they are usually curved or bent, and there are more of them. 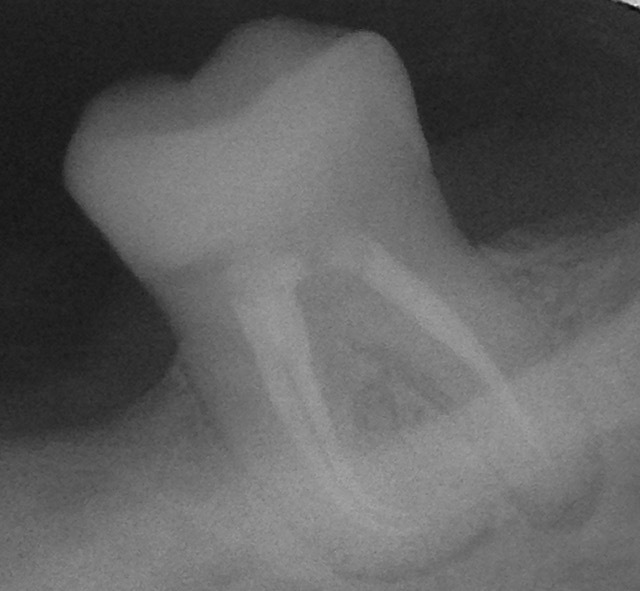 Here is a radiograph (X-ray) of a molar root filling with very curved roots on the left side of the picture. These root canals bend sharply near the end of the root. These two root canals were very difficult to work on! And even with all my gadgets I couldn't get all the way to ends of the roots there, so you can see that the root fillings on the left side are a millimeter or so short. Also, just for fun, molar teeth are at the back of the mouth, where they are MUCH harder for a dentist to get to and see clearly. Some dentists and specialists will even use a surgical operating microscope to see better! All these factors add up to the dentist needing more time to do a thorough job. MUCH more time - maybe up to 3 or 4 hours. And that is why a molar root canal treatment costs more than other teeth!